Dapper & Stout Coffee Company Opens Second Location - Downtown Phoenix Inc.
A coffee concept so on trend, that its fans are known to “Eat, Drink & Stay Dapper.” Now open in Collier Center, this beautiful coffee stand fills a 635-square-foot, 18-year vacant space, and brings about 14 new jobs to Downtown Phoenix. Under construction since November 2018, Dapper & Stout Coffee Company launched on Wednesday, March 20 at the corner of Washington and Third streets, with a grand opening on April 10. Facing Symphony Hall, the Phoenix Convention Centers, and adjacent to Chase field and Talking Stick Resort Arena, this walk-up coffee shop is the perfect addition to the urban core. Operating hours are seven days a week, 6 a.m. to 8 p.m., serving mouth-watering grab and go sandwiches, soups and pastries. Online ordering and delivery options are available through Uber Eats, Postmates , Grubhub, Doordash and also via the dapperandstout.com website. Must-try options include the community favorite Spicy Italian or Breakfast Bagel, which features scrambled eggs, roasted red peppers, mozzarella and a delicious pesto mayo. There’s also a sweet Banana-Nutella Panini, which is exactly what you’d dream it to be: a gooey, delicious mess of hot hazelnut spread and fresh bananas on vanilla batter-dipped toast. The espresso menu features custom roasted “Ensemble” blend beans, frappes, lattes, protein shakes, macchiatos, smoothies and more. Come join the Dapper community, and make this your new go-to coffee shop in Downtown Phoenix. 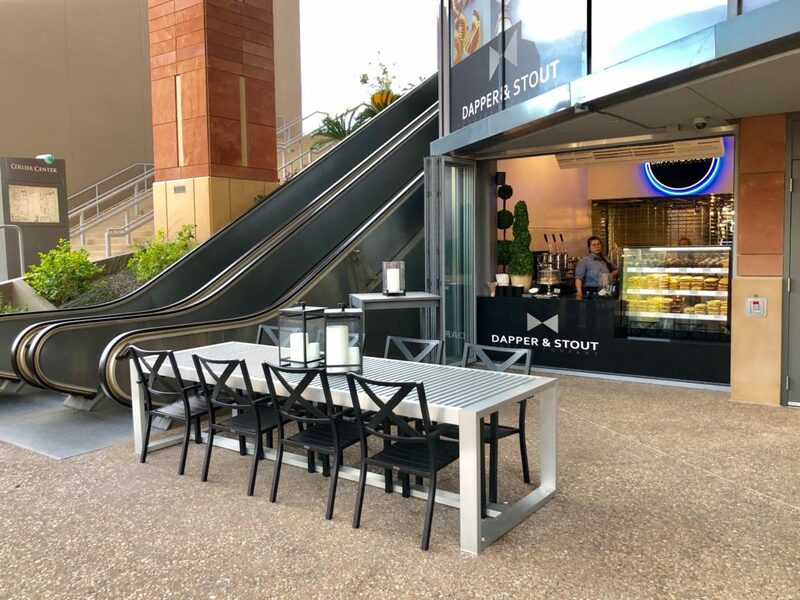 Founded in 2017 in Glendale, Ariz. by restaurant veteran Aaron Lopo, who brings 18 years of restaurant experience, Dapper & Stout is the newest to join the coffee scene in Phoenix, featuring made-from-scratch paninis, the best coffee in the business, friendly Dapper Dames and Dans, and the latest in high-energy coffee bar entertainment. Dapper & Stout now has two Arizona locations, with plans to expand throughout the states. For more information, visit dapperandstout.com and follow us on Facebook and Instagram.